Brand new apartments in Vaujany (part of Alpe d’Huez ski area, soon to be linked to Les 2 Alpes)ready for delivery. It is only 3 minutes walk from the ski lifts (main cable car) which give you access to 250kms of high altitude skiing. The chalets are also close to all the village facilities (5 minutes walk) and the apartments offer superb views of the valley and famous waterfall. Prices are very reasonable and all apartments offer really nice sleeping capacity with for the smaller ones an added coin montagne for bunk beds. The apartments come with a ski locker and lift in chalet to all floors and video entry phone. Brand new apartments in Vaujany (part of Alpe d’Huez ski area, soon to be linked to Les 2 Alpes)ready for delivery. It is only 3 minutes walk from the ski lifts (main cable car) which give you access to 250kms of high altitude skiing. The chalets are also close to all the village facilities (5 minutes walk). These apartments offer far reaching views over the mountains around you and the famous waterfall. Green surroundings with outdoor spaces designed to open up a whole new perspective on the surrounding Alpine peaks and the world beyond. An enviable location, perfectly placed to enjoy the superb amenities in the local area and to take advantage of the many benefits that Vaujany has to offer. The apartments at Domaine du Pâtre in Vaujany are sold a fully-equipped kitchen as well as a ski locker (partitioned for owner/guests use when doing rental (price 20% includes VAT) and free parking on site. If you wish you can purchase a closed garage in the underground parking (19,000-31,000€ between 17-31sqm some for 2 cars) and a storage room between 4,000-6,500€ (4-6sqm). An exclusive collection of 2 and 3-bedroom 1/2 bathroom apartments which are southern-facing aspect featuring terraces and balconies to the living area and main bedroom for some of the apartments. The design complements the spacious layouts and the hidden fixtures of acoustic and thermal insulation. This is modern living at its best with interiors that are modern, yet also welcoming; aspirational while also very comfortable, and inspired by the mountain heritage but also timeless. Contemporary designed fitted kitchen (included in price) with feature cupboard, modern worktops, splashback with feature ceramic tiles above and integrated appliances ready to be enjoyed. The style is typical Alpine combining stone and wood to keep up with Vaujany’s architectural identity. The level of finish is exceptional and the common areas (corridors, entrance, terraces are really premium and made to last). Electric shutter in the living room and bedrooms, wood parquet in bedrooms, fully-equipped bathrooms with a towel rack, and extensive private terraces. There is also a cleaning area for mountain bikes in the basement and hot water production by a heat pump and solar panels. Now is the time to invest in Alpe d’Huez ski area as the new link to Les 2 Alpes will make the domain one of the most extensive in Europe and most importantly one of the highest, including glacier skiing in summer. “Le Domaine du Pâtre apartments in Vaujany offer an excellent location close to the village centre all within easy walking distance and same for access to the cable car. The quality of finish is excellent and the apartments feel really high-end. Panoramic views over the mountains and the valley with extensive terraces. All apartments in chalet 01 have open views + chalet 02 most apartments + chalet 03 from 1st floor upwards. Very good sleeping capacity for all the apartment with great rental potential. 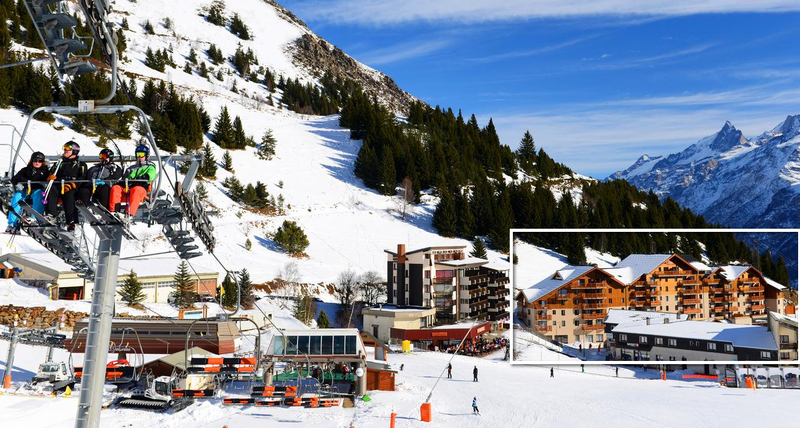 Grand domaine ski area to link to Les 2 Alpes ski area in 2020! Vaujany is a traditional mountain village with wood and stone chalets, its small streets, fountains, farms and church. Located in Isere and facing the majestic Grandes Rousses mountain range, Vaujany has kept its identity and mountain traditions yet the different infrastructures linked to the winter and summer activities are very modern. You will enjoy the almost endless amount of activities whether in winter or summer all set in this grandiose scenery. It also offers 250kms of Alpine skiing (high altitude up to 3,300m) as well as many tracks for hiking, cross country skiing as well as snowshoeing and more. Summer activities are many not to mention the famous Tour de France in Alpe d’Huez.